The FBI and emergency crews responded to the New Haven Register building in New Haven building because of white powder that was mailed to the newspaper offices. The Federal Bureau of Investigation has responded to the New Haven Register building because of white powder that was mailed to them, according to New Haven police. 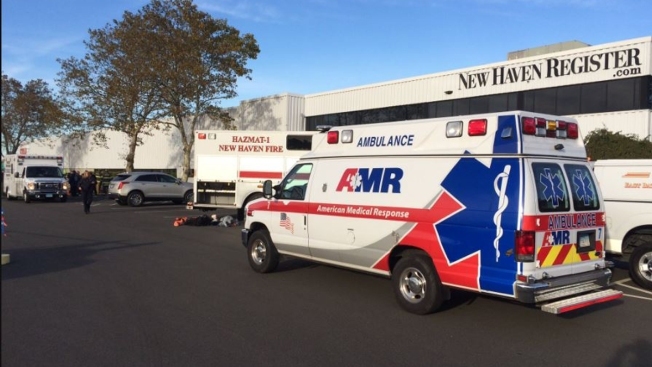 New Haven Register Publisher Kevin Corrado told NBC Connecticut that two employees who came into contact with the white powdery substance had to be quarantined inside the building while everyone else was evacuated. The two employees then went through a decontamination process and were taken to the hospital as a precaution. As of 5:30 p.m., employees were allowed back into the offices. NBC Connecticut reached out to the FBI, but they said at this stage they had no information to release and had not identified the substance.